If you have been told that you need to have a dental crown / tooth cap, or perhaps you think one might be necessary, you are likely to have some questions and concerns and want to better understand them. This guide is just what you need. It contains lots of useful information for you to better understand what a crown is, why it might be needed, what is involved and what alternative treatments might exist. What is the difference between a dental crown and a cap? How long do dental crowns last for? A crown is a man-made (artificial) covering that fits over the remaining part of a prepared natural tooth. It is an option that exists within dentistry to restore strength and aesthetics to teeth. Custom made for each patient, a crown provides an aesthetic and functional purpose to those patients who need it. An accident or disease may have left one or more of your teeth weak or damaged. The crown is one means by which the natural tooth can be saved, strengthened and to some degree protected from procedures such as tooth extraction. Decay is one of, if not the largest contributor to the need for crowns. Relatively minor decay can be treated with fillings. However, more severe decay, once meant tooth removal. 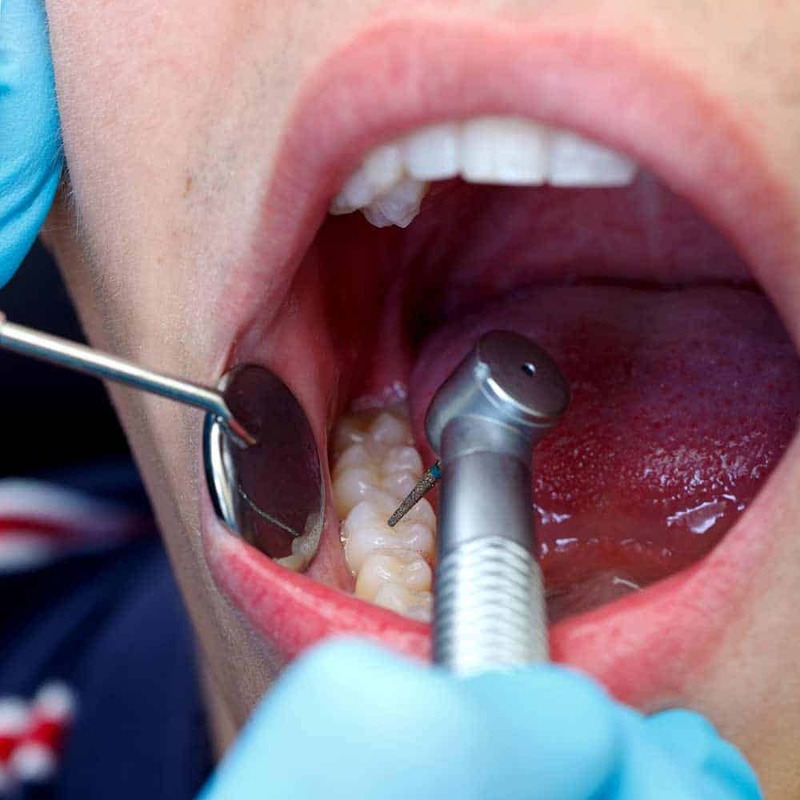 This is a job dentists would rather not do because of the knock on implications. Today, procedures like root canal treatment can be completed and then a crown fitted as a way of avoiding extraction. For a clearer understanding of a crown and what it does it is helpful to look at the structure or anatomy of the natural tooth. 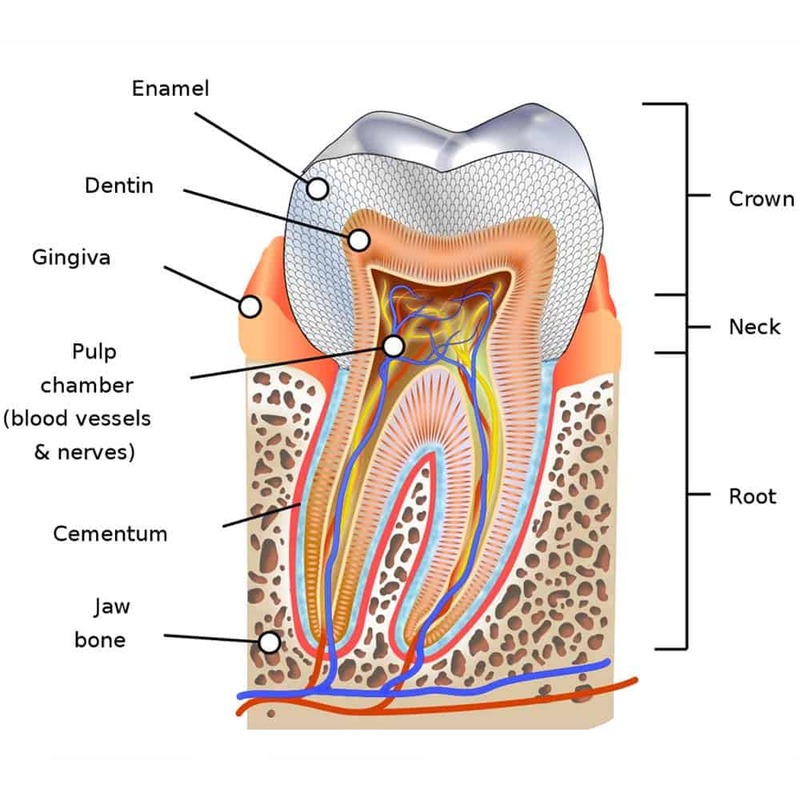 As the image below depicts, each tooth has what is known as a crown, the top outer layer that sits primarily above the gumline. The natural tooth crown is what we see when we look at our own or other people’s teeth. It is what comes into contact with food and drink we consume, and is the main surfaces we clean when brushing and flossing. If this natural tooth crown is damaged or weakened, it cannot perform as it was designed to. If pieces of the crown break off, the dentine and pulp inside the tooth can become exposed and then damaged or infected. This then impacts our oral health and the way we live day to day life. Dental treatment can overcome this and the artificial crown we detail in this guide is one option. It essentially replaces the natural crown to restore the tooth to remain functional and visually appealing. There is no difference between a dental crown or a cap, they are the same thing. A ‘dental crown’ is the more technically correct terminology whereas a ‘cap’ is a more convenient and often more understood term by the general public. Cap or crown, they do the same thing. A traditional crown or cap covers the whole of the tooth. A partial crown is a solution that does not cover the whole tooth. As the name suggests, it covers part of the tooth. Fitting any crown requires adaptations to be made to the natural tooth to be able to essentially stick the artificial piece in place, these partial crowns require fewer changes to the natural tooth. Also known as inlays, onlays or three quarter crowns they are an alternative option to a full crown. As highlighted in the following video, a partial crown is in some cases a better alternative and technology such as CEREC (explained shortly) can really help do away with the need for the full crown. Evidence suggests that gold and other materials were used to create crowns and bridges by the Etruscan civilisation dating back as far as 800 BC. However, in more modern history it was in 1889 that the all-porcelain “jacket” crown (PCJ) made from porcelain was created by Charles H. Land. After improvements by E.B. Paulding, the crown was introduced in the early 1900s and extensively used until the 1950s. Microcracking was an issue with these crowns though. This happened during the cooling phase of the fabrication and caused issues to the crown and the tooth and gum that sat beneath it. Despite not lasting all that long, whilst in place it was effective. Abraham Weinstein developed the porcelain-fused-to-metal (PFM) crown in the late 1950s. Weinstein’s PFM addressed the structural issues of the PCJ but brought with it a less pleasing look than the all porcelain option as a small amount of metal was visible on the edges of the crown. In 1965 a new version of the all porcelain crown was developed by W. McLean and T.H. Hughes and brought about a resurgence in its popularity. It was twice as strong as the original PCJ. As these developments took place, the Corning Glass works played with different processes to produce a glass ceramic option. Dicor crowns were introduced but ultimately were abandoned as they were prone to failing. It was in the 1990s that the first dependable crowns without a metal base came into existence. 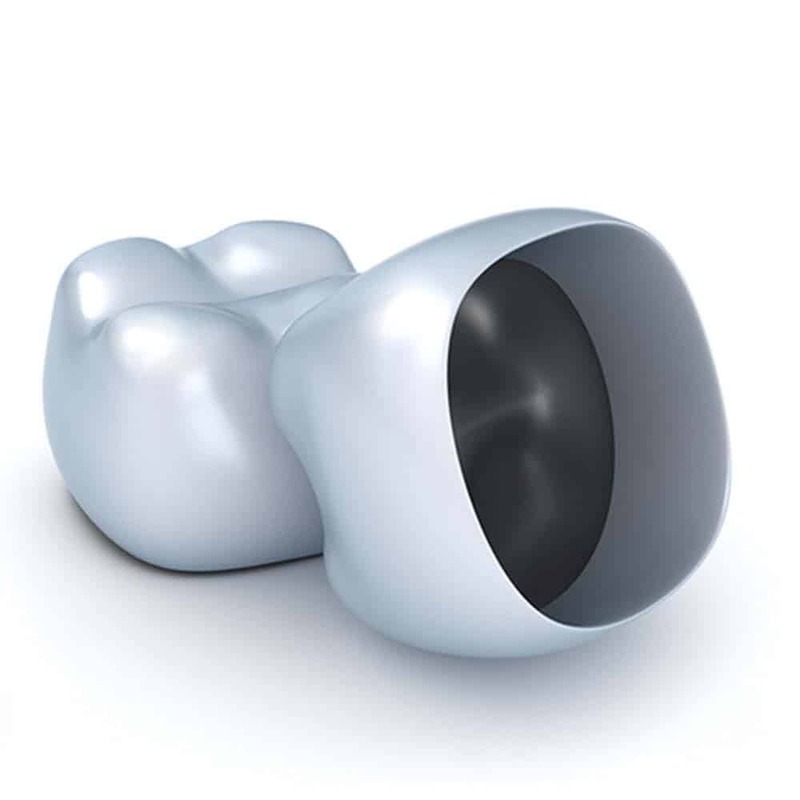 Marking a turning point in crown development Nobel Biocare introduced the Procera AllCeram Core which made using computer aided design and computer-aided manufacturing (CAD/CAM) to produce crowns made of alumina and fused with glass ceramics. Tie in the growth or the cosmetic industry and the result is the array of f ceramic restorations we have available today. 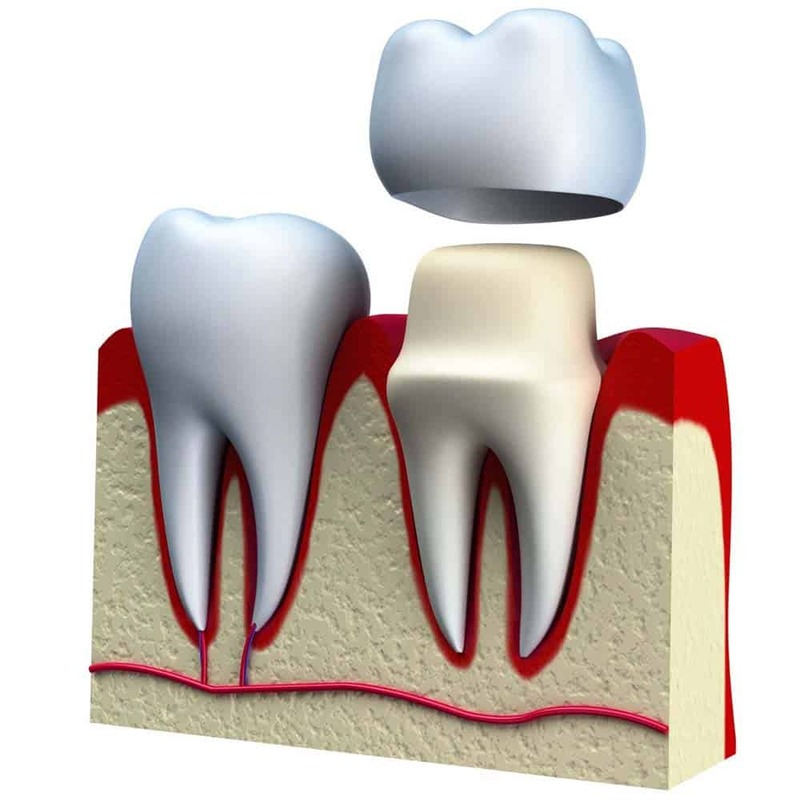 There are several different types of material that are used in the construction of a dental crown. Each have their pros and cons, but most popular are porcelain or zirconia as they look most like a natural tooth when fitted. A strong metal crown is formed and then coated in layers of porcelain to give a more natural look. The porcelain has a tooth coloured appearance. The metal at the back means less tooth needs to be removed and so protects the natural tooth. Most commonly used it is a blend between strength and the aesthetics. 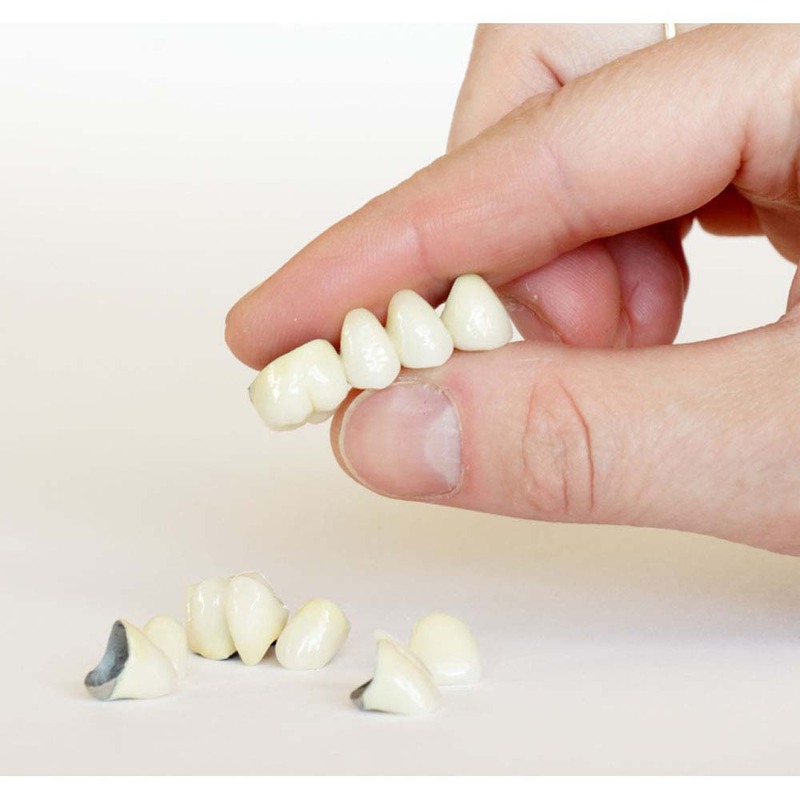 Made entirely from porcelain these crowns give the most realistic natural tooth look and are used most often on the front teeth. They are more fragile than most other materials. A significant amount of tooth needs to be removed for thick enough porcelain to be placed to reduce chance of breakage. Free of metals, a crown of this type is as strong as a bonded crown, but has the appearance similar to that of a porcelain crown. It is therefore a suitable option for use in all areas of the mouth. A significant amount of tooth needs to be removed for thick enough ceramic to be placed to reduce chance of breakage. A more cost effective alternative, resin crowns wear down and do not last as long as they are more prone to fracture. Does not require a lot of removal of tooth stucture. Made completely of metal, notably nickel, cobalt and chromium this can include precious metals such as gold. However, today gold is mixed with other metals to create an alloy as on its own it is too soft. Although made of a gold metal alloy, the crown still looks gold and can contain anything from 20-77% pure gold. Subject to the metals used they have either a silver or gold look to them. They do not have the natural tooth look. Which material is used for a crown will depend on where the tooth is, the amount of natural tooth remaining, and the cost of the material too. Availability may come into play (for example, in the NHS, where cost naturally plays a part) as well as personal budget and personal circumstances such as your individual bite and if you suffer with known conditions like tooth grinding (bruxism). 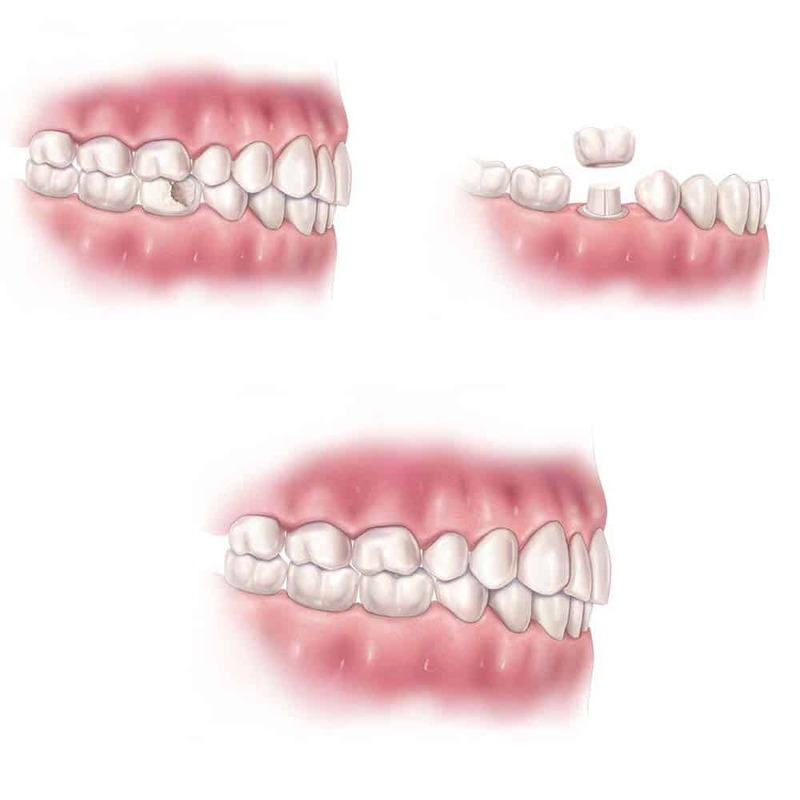 If it is the front teeth, those most visible when you smile, you will likely want the most natural looking crowns, whereas with caps on the molars, you may not be quite so concerned, going for strength over aesthetics. Temporary crowns are artificial caps for your teeth that are made from acrylic or composite materials and are designed to be placed onto a prepared natural tooth for a few weeks. They are in place whilst a final, custom made crown is manufactured by a laboratory. Once removed, they are no longer used. Usually made in the dentist’s office, they are more delicate and not quite as precisely colour matched or fitted to your mouth, they serve to protect the more sensitive natural tooth and allow you to function with a certain sense of normality until such time as your final crown is ready for fitting. Creating artificial crowns, just like veneers and dentures, is an art form. How well a crown is designed and looked can have significant impacts on those who are fitted with it. There are 2 options when it comes to designing a crown. The traditional option in crown manufacturing is using highly trained professionals, called technicians, who painstakingly create each crown by hand. There are different techniques for different materials, but each individual crown takes hours to make. Technological advances may have helped speed up some steps in the creation process, but the initial stage relies on a mould sent in from the dentist being used to skilfully build a crown to the specifications of the patient’s mouth, using the materials chosen. For the most part, dental labs can can produce the best results thanks to their expertise, attention to detail and many hours spent crafting the component. The main downside of the lab is the time it takes to be received, designed and returned to the dentists office. Chairside Economical Restoration of Esthetic Ceramic (CEREC) is also known as same day or single day dentistry. Making use of the very latest in computer technology, it is possible to have crowns designed, manufactured and fitted in just one visit to the dentist’s office. State of the art CAD/CAM technology is used, starting with a digital scanner to scan the teeth in your mouth. his is uploaded to a computer and CAD/CAM technology is used y your dentist to design the crown to fit your tooth, taking into consideration all data gained from their hands on assessment and x-rays. Where traditional practice would be to send a mould off to the lab and wait a couple of weeks for the crowns to be returned, with CEREC the design is sent to a a specialist milling machine installed in the dentist’s office that can produce it in as little as 10 minutes. Different materials are used within these machines, it can include porcelain, but is often ceramics. 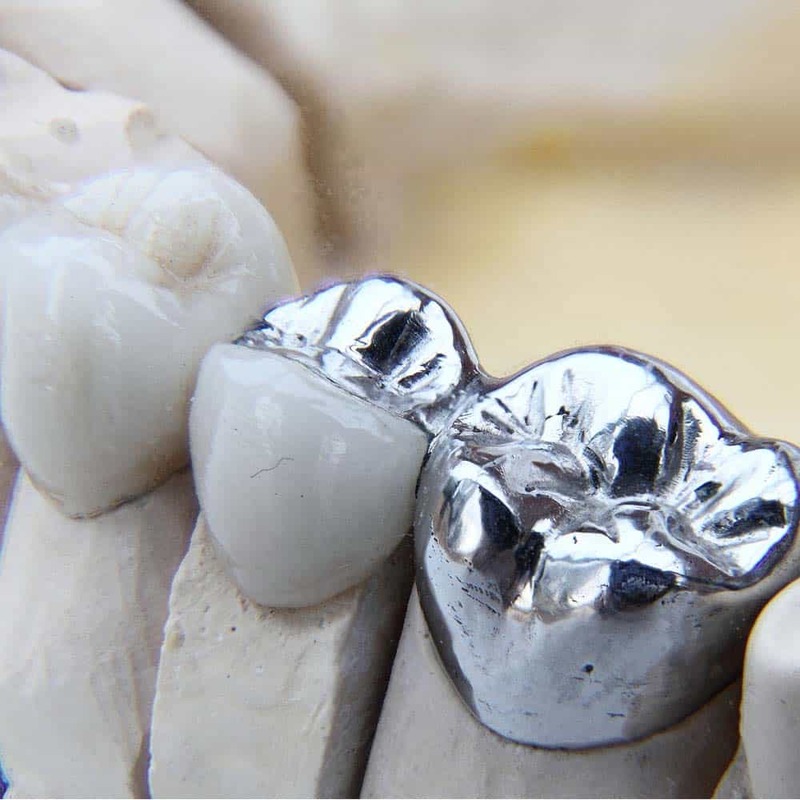 The process is quick and the resulting crown is aesthetically better than the porcelain fused to metal. A CEREC manufactured crown could be a great option for teeth at the back of the mouth, but for the very best look, you may want to consider porcelain for the front teeth. Creating a crown is an art. However, with the right skills and experience, the dentist can design some excellent crowns. You may wish to see examples from other cases. Another big benefit of the CEREC technology is that it gives the dentist more options to create partial crowns in a way not so easily achieved with traditional lab processes of molding and off-site design. The steps involved in the process to getting fitted with a dental crown will vary slightly depending on the reason as to why a crown is needed in the first instance. Getting a crown fitted is a decision that should not be taken lightly, it requires quite significant adjustment of the tooth to make space for the new crown. The amount of space required depends on the material used for the crown, and how your teeth bite together. It is important to fully understand why it is you need a crown and whether it is the right treatment for the problem. It is possible dental decay or a loose/broken metal filling it the cause and it may well be necessary to have some additional treatment to replace broken fillings prior to a crown being prepared and fitted. Even if you are wishing to get a crown for purely cosmetic reasons, is it the right choice? Let’s presume that the need for and the commitment to getting the crown has been made, you can then expect the process to be roughly as follows. In what is usually the first of 2 visits to the dental office, this phase is all about preparing the tooth ready for a crown to be fitted onto it. A tooth under normal circumstances requires quite significant alterations to the existing, natural tooth structure for the new crown to be fitted. Before any actual adjustments to the tooth are made, the dentist should first take an x-ray and perform clinical assessments of the teeth to ensure that the existing tooth is healthy and capable of taking a crown and no complications should come about as a result of fitting one. This step will often have been completed previously as part of the consultation and decision making process. 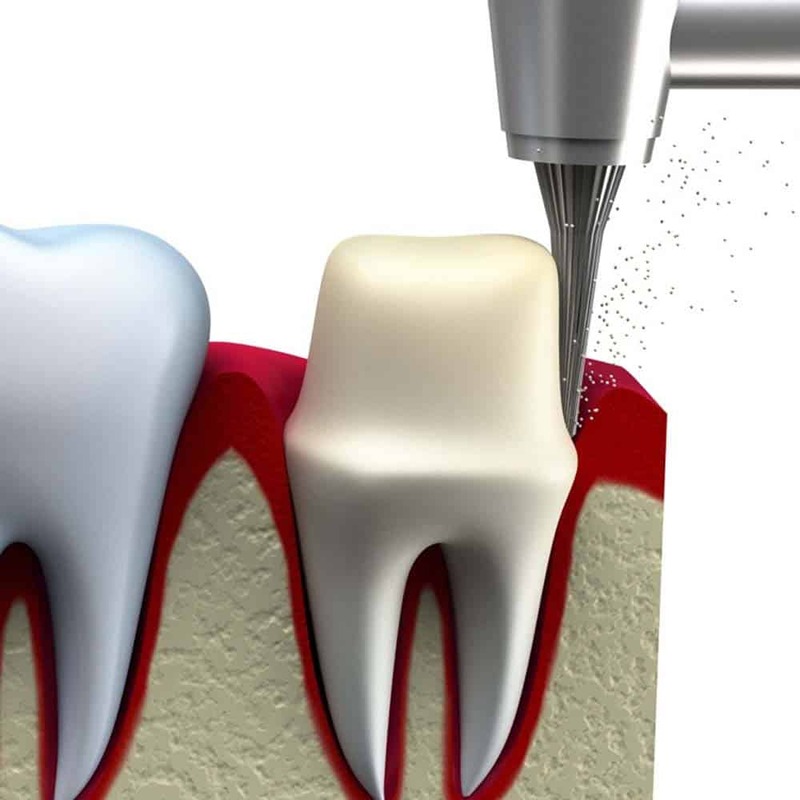 Prior to the dentist using specialist tools to grind down the surface of the tooth, the area around the tooth will normally be given a local anaesthetic, which means it will be numbed and you should not feel any sensitivity or pain. If the tooth has already had a root filling, there is no nerve left, and this step may not be necessary. If there are loose or missing metal fillings the dentist may need to actually ‘build up’ the tooth to restore some height , structure and shape – this is called a core. They can then go on and create space for the crown. There needs to be at least 2mm of natural tooth all the way around the tooth for the crown to stick on, known as a chamfer. Without this, the crown is only stuck on to the filling, and it will snap off under pressure. To give the strength to crowns, most materials need to be 1-2mm thick. This gives enough depth to the crown to last several years in the mouth and endure the pressures that it will be exposed to without the material cracking under pressure. As a consequence, the existing natural tooth needs to be thinned by the same amount for fitting. This thinning is usually 1-2mm to ensure that the cap is designed to replace the natural crown of the tooth and will fit snugly. Just a couple of mm may not sound all that much, but this is quite invasive when you actually consider the thickness of a tooth and the process involves removing the majority of, if not all of the enamel on the exterior of the tooth. As it is removed, a process of shaping is performed to provide an ideal surface onto which the artificial tooth crown can be fitted. The tooth surfaces are straight, or very slightly tapered (thinner towards the biting surface of the tooth), this helps prevent the crown slipping off when it has been stuck down. As mentioned previously a root canal treatment is one such example of a procedure that may well have to be completed. A point to note here is that with such treatment a post may well be put into the tooth root to help support the the tooth and crown, to the surface of the tooth may will be manipulated differently. Once the dentist has prepared the natural tooth ready for fitting the final crown, an impression will be taken to allow the crown to be made. An impression is taken of both arches of the jaw, to allow for a perfect crown to be made. Both jaws need to be considered in the design of the crown, because when you close your mouth, bite down and eat you do not want any complications or restrictions. It is at this point too, the colour of your teeth will be assessed and recorded to ensure the crown matches (if a colour matched crown is being used). These moulds are then sent off to the lab for the crown to be made. In the meantime you will be fitted with a temporary crown and sent home before returning in a few weeks time. It is here where CEREC utilises the latest technology to transform the process. Rather than traditional moulds, an oral scanner uses a camera to build a 3D picture of the mouth. This is then used by the dentist to design and produce the crown you require on-site. That crown can then be fitted the same day. This does away with the need for temporary crowns and no need for a 2nd visit. Assuming it is preparation for the crown only and no other dental work required, from start, expect the process to take 30-60 minutes. Several weeks on from the preparation stage, the day you have been waiting for will have arrived, your final new crown is to be fitted. This is a much quicker and less involved process, but still very important as the crown needs to be positioned correctly to stay in place for the years to come. As per the previous visit, you may well have some anaesthetic to make the area numb whilst the dentist does what they need to do. Once numbed, the temporary crown will be removed and the stump of the remaining tooth cleaned up. Before it is cemented in place the dentist will position the crown to check the fit of the crown. the alignment with other teeth as well as assessing your bite. They will also check you are happy with the colour if the tooth is easily seen. It is possible that the dentist will have to make some small adjustments to the crown or to your tooth stump. In the worst case scenarios, which are rare, it will have to be stopped because the crown simply does not fit right. If this happens, new moulds will be taken and the temporary crown re-placed. Providing they are happy, the dental cement (glue) will be placed inside the crown and the crown will be positioned over the prepared tooth. Pressure will be applied to help form a seal and push out any excess cement, which will of course be removed. This is the fitting complete. This stage of the process should take on average 20-40 minutes to complete. If opting for CEREC based treatment, this fitting would take place the same day as the tooth was prepared. There are potentially 2 stages to the recovery process, there is the period after the 1st visit where the tooth is prepared and then you have the recovery post the actual fitting and cementing of the crown. If local anesthetic has been used, you can expect the numbness to last for up to a few hours after the dental visit. 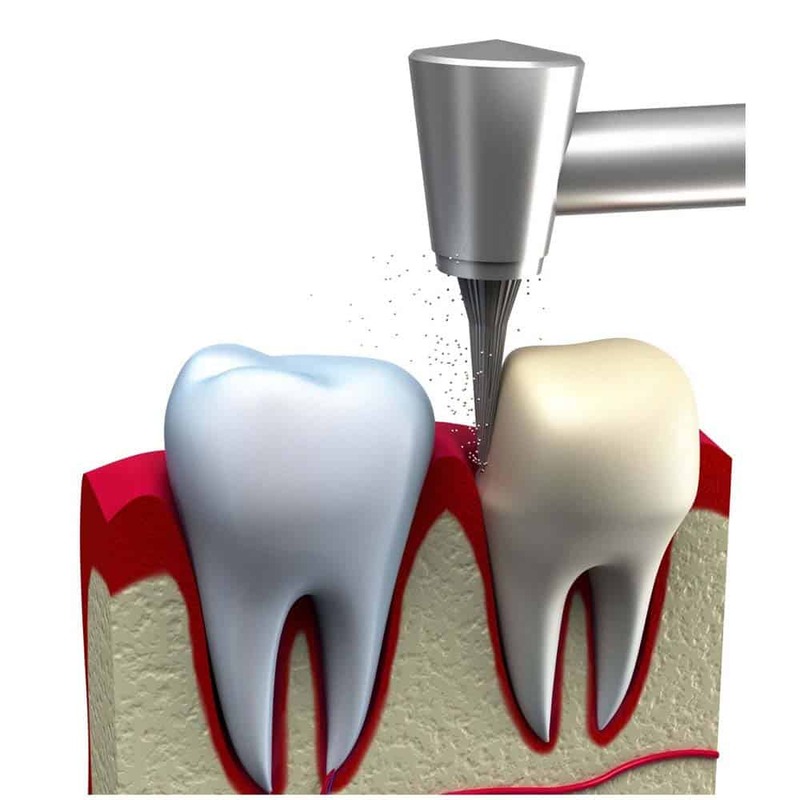 There may be mild sensitivity to hot and cold for a couple of days because of the drilling on the tooth. This will subside and you should not have any pain thereafter. Your tooth is most vulnerable in between preparation and fitting the final crown. Some suffer sensitivity in the tooth as a result of losing a large amount of enamel. This is in part why an artificial crown is provided. The artificial tooth protects the more sensitive natural tooth and makes the stump of the tooth no longer visible. Over the couple of weeks where the temporary cap is in place you should avoid chewy or sticky foods and some harder foods like carrots and apples. It can be useful to bite more on the opposite side of the mouth to the crown. Throughout you should not suffer with sensitivity or complications, if you do, speak to your dentist. When flossing whilst wearing the temporary crown, you should be careful as the floss can catch on it. Slide the floss out sideways rather than pulling up and out like normal. It is important that you continue to clean between the teeth as the gum needs to be as healthy as possible when fitting the permanent crown. Once the final crown has been fitted for the first few days avoid hard or sticky foods as the crown settles and secures into place. As you might expect, post treatment and fitting the new crown may feel a bit strange and it may well take a couple of weeks to get completely used to it. Although it will have been precision designed it will feel different to what you were used to. If you have concerns post treatment, you should consult the dentist. There are several different factors that can affect and influence how long a crown lasts for. 2 of the biggest influences are you mouth condition and the care that you give to your mouth after having the crown fitted. Good oral hygiene and a well aligned bite will aid with longevity, whilst decay, teeth grinding and a misaligned bite will wear the crown more rapidly. As a general rule dentists will suggest 5-15 years as an average for crowns. Whilst they have not been designed to last a lifetime, they can last several decades. With all crown preparations in teeth which have not been root treated, there is a risk (up to 25%) that the tooth will die off in the following 20 years. Research conducted in 2007 by a team at the Faculty of Medicine and Health Sciences, Ghent University, Belgium found there was no statistically significant difference in the long-term survival of complete crowns on vital abutments versus post-and-core complete crowns. 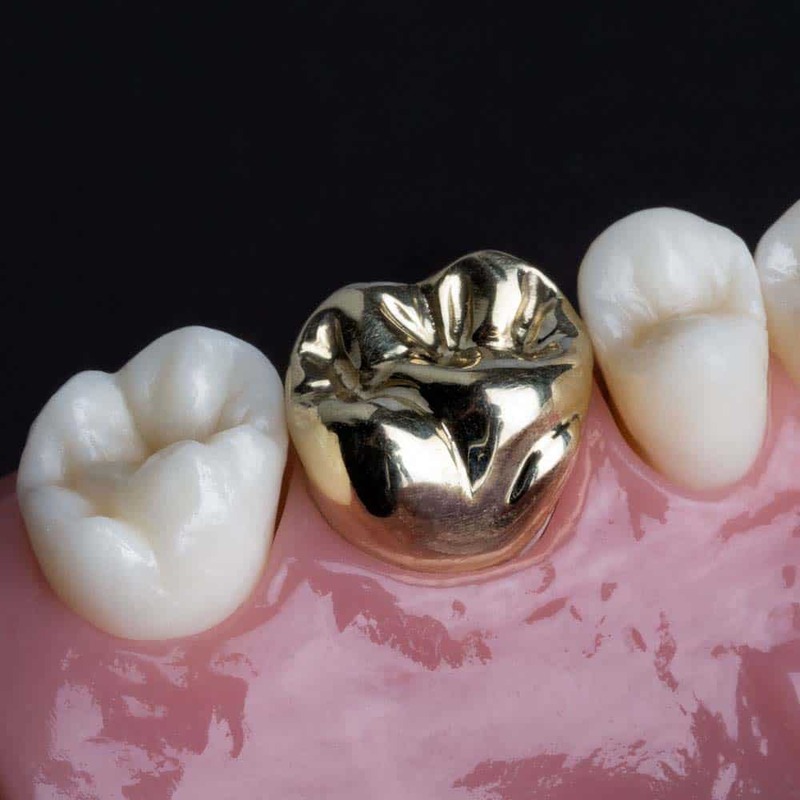 More recently in 2013, a study by the University of Sydney found that upon assessing 2,340 gold based metal-ceramic crowns, 97% were still in place at 10 years and 85% at 25 years. By the very material makeup, ceramic crowns are more vulnerable to breaking or damage and will likely not last as long as metal alternatives. If you suffer with receding gums, the metal edge of a PFM crown may become exposed over time. Keeping your gums as healthy as possible will reduce the risk of gum disease and gum recession. Should any crown crack, chip or come off entirely, you need to consult your dentist as soon as possible. Chips can be filled as a temporary solution, but ultimately the crown will need to be replaced. Loose crowns might well be re-fitted, subject to the condition and reason for it coming loose in the first place. If a tooth has been crowned, when the existing crown fails, it will need to be crowned again if there is enough tooth remaining. Because the tooth is prepared for a crown before there are no other options, aside from extraction, which is more than likely not necessary and brings with it additional complications. When fitting a crown for the 2nd time, the first stage of preparation that involves removing enamel is much easier, and normally only involve minor adjustments. A new impression will be taken to create the new crown. Cracked, chipped or damaged crowns. The crown is itself worn or has worn down other teeth. The underlying tooth is experiencing decay. The cosmetic appearance of the crown is changing. If the crown is being replaced because of decay underneath the crown, there is a risk that when the decay is removed, there is not enough tooth remaining to hold a crown in the future. In this case, an extraction will most likely be recommended. Just because the top of the tooth has essentially been replaced, it does not mean that you need to forgo a proper oral healthcare routine. In many respects there may well be an argument that you need to take even more care, particularly if deay was the reason that the crown was required in the first place. Twice daily brushing is an absolute must, as is flossing. Using a fluoride-containing toothpaste also provides protection against decay. As the crown sits on the natural tooth which is fixed into the jaw and gum, it is still susceptible to decay and periodontal (gum) disease. Depending on the design, the very edge of the crown will normally sit below the gumline slightly and not actually be visible. However, when it comes to flossing, as the floss passes into and under the gum, it might well be that the floss catches on the very edge of the crown. In this instance you may want to use interdental brushes, if you do not already. 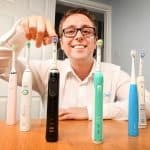 Or you can look to use a water flosser, which is another very popular alternative, that does not rely on the physical contact. It is advisable to seek regular professional cleanings by trained hygienists who can make use of their specialist skills and tools to ensure your teeth and crowns remain in optimum condition. Of course, regular dental checkups is a must too. The training and expertise of the dentist will pick up on any issues with your dental health or the crown itself. As you might well expect or have gathered from the information provided so far, there are many variables that can affect the cost of producing and fitting a crown. From the materials, to the dentist to any other work involved, these are just some of the factors that influence the final cost you may have to pay. For those UK residents eligible for NHS treatment, crowns can be provided on the NHS. Crowns are only provided on the NHS where necessary and not because you want one to improve the look of your smile. This treatment falls under the highest band on the NHS dental treatment charges, Band 3, which at the time of writing is priced at £256.50 in England, £195 in Wales, £77-143 (approx) in Scotland, £71-£110 (approx) in Northern Ireland. Much cheaper than private treatment, when completed on the NHS you will not be offered as wide a range of aesthetic appearances, and it is likely that you will be offered metal crowns for rear teeth and colour matched crowns for those front teeth that require them. Whilst the back teeth are less visible when we open our mouths, you might not like the idea of metal caps, so many NHS practices also offer private treatments, whereby you can essentially upgrade to get a colour matched crown. Under NHS treatment, you also have the benefit that any other work required will be carried out at this rate in England and Wales. For example, root canal treatment often requires an artificial crown to give strength back to the tooth. Whilst root canal treatment falls under band 2, the crown is band 3 treatment. The good news is you pay just band 3, not band 2 and band 3. 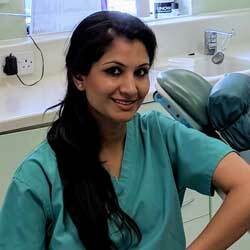 When you opt to go for private dental treatment you get the greatest choice. Because you are paying for it, you may have the option to opt for a crown even if you want it only for cosmetic reasons, rather than clinical reasons. Different practices will have different prices with highly sought after cosmetic dentists charging the most for crowns, but as a guide expect the following costs, per crown. There may will be some cost saving if you are having multiple crowns made as these can be prepared and fitted as part of the same treatment plan, but do not expect huge discounts as there is still much considerable time and cost involved in the creation process. Do be aware that these costs will not include any other treatment required beforehand. As per our example of the root canal treatment, this would be an additional cost to the crown and not included in the price. It is quite well documented that going overseas can be a more cost effective route when it comes to dental treatment. Particularly so if you are not eligible for NHS treatment or you can’t get what you want on the NHS. As a rough generalisation you can save up to 50% on the costs typically charged within the UK. When you factor in the costs of flights and accommodation, for 1 or 2 crowns it might not be that appealing, however for more expensive treatments, the savings can be quite sizeable. Poland, Hungary and Spain are a few of the popular destinations whilst India and Turkey are also popular choices, although a little further to travel to. A cost of a single crown can range from about £150 through to about £400 on average. Just consider when going abroad, it is more difficult to makes changes or get repairs completed. A UK dentist may not have the same materials available, and it may even cost you more than your original trip. Also be wary about how the dental care is regulated abroad, and know where to go to if something goes wrong. It will be up to you to weigh up the pros and cons of going overseas to complete such treatment, but if you decide it is the right choice for you, make sure you have done lots of research before coming to this conclusion. Producing and fitting a crown falls a little under 2 different areas of dentistry. They can perform both functional and cosmetic roles. General dentists will create and fit crowns as part of their day to day work and for the most part there is no issue with this. A cosmetic dentist can also produce and fit crowns, but they may well take a slightly different view on the treatment given they specialise in the appearance of the crown. You want to ensure you get the best return for your money and a result you are happy with. Upon learning you need a crown, you may want to consider whether the dentist you use or advised this is the best person for the job. Given that a crown will last for many years, it needs to be done right. It does not hurt to get a 2nd opinion, or maybe a 3rd to understand your choices, but learn whether the dentist is right for you. It is important you trust them, that they have a good reputation and experience. For those who have phobias or anxiety of the dentist, perhaps newer CEREC technology is an option to speed up the process and relieve the anxiety you have attached to the treatment. You may need to seek out a different dentist for this. When seeking private dental treatment you have considerably more options than you do when on the NHS as the budget constraints imposed. When choosing a dentist to do your crown, look for somebody with experience of crowns, who gives you all the options with the risks and benefits. If you are looking for a cosmetic result, dentists who have completed special cosmetic courses may be better. In most instances a dentist will advise the best treatment based on the conditions presented at the time. If there is severe decay and root canal treatment with a cap are the best option then the dentist should suggest this. Where just a filling or a veneer might be an option they should present these too. If a dentist suggests a crown it is important you ask questions in order to really understand why a crown is the best option. That dentist may well be operating within the confines of their skills, and there may be other options available elsewhere. For example a crown might be the go to option with NHS treatment based on the conditions presented. There may be other options with less chance of success, and if you were willing to pay privately you might be able to take advantage of alternatives, such as a less invasive white filling. Far from this being a criticism of the NHS, it is simply the case that private practices are better funded and able to take advantage of advances in dental technology. There are now more options available than there were in years prior. These options are not necessarily cheaper, but can be less invasive and retain more of your tooth. The best example is CEREC technology, explained earlier in this guide. A partial crown may well be constructed in preference, or maybe a veneer is an option, but may not be a choice available with the NHS. So if you have been told or are told you need a crown, ask why and whether there are alternative options, if I paid privately. To help conclude all of the information presented within this guide the following table gives a quick summary of your choices when it comes to dental crowns and should hopefully help you on your path to making a decision as to what is right for you. Description	 A balance between strength and looks. Most natural looking crown, but weaker. Ideally suited to front teeth. Very close to natural look with good strength. Suited to all teeth. Cost effective option that wear more easily and are prone to fracture. Incredibly strong, but gold or silver colour can be less appealing. Best suited to rear teeth. Fast production and fitting retaining more of the natural tooth. What might just be an artificial cap for your tooth is complex and a piece of art that is designed to perform for many years. Our teeth form part of our smile and with a set of well maintained teeth, we can feel much more confident and our overall well being is much improved. Whilst you have to make the right decision for yourself based on your circumstances and budget, we hope this guide has given you some extra insight and awareness of what is involved to allow you to make a more informed decision as part of your own research and consultations with dental professionals. Does a dental crown hurt? No, there should be no pain associated with getting a dental crown nor should it hurt. This said, the grinding down of the tooth structure ready for the crown can result in the tooth becoming a little sensitive, particularly to hot and cold food stuffs. Between the preparation and fitting stages of the procedure a temporary crown will be provided to help reduce the chances of sensitivity. If an anaesthetic is used, you may feel a little discomfort as the numbing agent wears off, but the tooth nor crown should not really hurt, although it may feel slightly odd for a few days as you get used to it. If you do experience pain you should contact the dentist for instruction on what to do. When completed correctly, there should be no problems or complications with a dental crown. However, there always remains the potential for problems to arise, this is more likely to be very soon after the fitting. Tooth pain – Ache, throbbing, pain when biting. Sensitivity – Hot or cold foods or cool air. Bite issues – Irregular bite, tenderness when biting. Causes tend to be the crown not having been properly fitted, too much or not enough bonding agent may miss-align the crown with other teeth and cause an uneven or unnatural bite. Whilst the dentist will have done what they can to check this when fitting, the numbing of the area may make it difficult for any patient to assess their bite until normal sensation is restored. As the enamel of the tooth has to be worn away it has the potential to expose the softer, more delicate dentin and even pulp that sits under it and as such reactions to food drink and even cool air can exist. The cause will need investigation by the dentist and if you are having problems or are concerned about a crown, you should seek their assistance. Should you have or be going through the process of a dental crown yourself, why not share some feedback for others to take advantage of. Assuming you have the crown (cap) and it is in one piece it should be a relatively simple job of re-fitting it. The dentist will likely clean it, as well as your natural tooth that remains. They will likely check your teeth and mouth as per a routine examination and use a bonding agent to stick the crown back onto your natural tooth using a special type of glue/bonding agent. The cost will depend on your dental practice and whether any extra work is necessary, but if it is a case of just bonding it back to the tooth, then it should be relatively inexpensive. It will likely cost not much extra than a regular checkup. Just to let those people know who are doubtful of having a crown. I have several in my mouth and 90% of them were put in over 30 years ago and they have not needed replacing. Just recently though, I had to have a bridge put in (3 crowns) and two of the former crowns had to be replaced to hold the bridge in and even after sooooo many years, the teeth under both of these crowns were as sound as they were the day I had the crowns put on. Btw, one of these re-crowned teeth even had a root-canal done 30+ yrs. ago which makes a tooth a bit weak and susceptible to breakage, yet it was still intact. Thanks for the feedback Linda. Great to hear the crowns have lasted so well. I had a tooth crowned, metal and porcelain fitting, on an NHS charge, and the permanent crown was fitted on 13th February. I have noticed today, 8 days later, that the crown appears to have chipped. Is this work guaranteed within the price I have paid? I cannot, nor would not like to give a guarantee to you that you would not have to pay for the crown to be repair or replaced, however, I think it would be highly unlikely, given the very short timescale since you had it fitted. You should get in contact with your dental practice and explain the situation. They should get you back in for an assessment to be made. It is important to understand why the crown has chipped. It’s quite probable that it is not properly fitted and/or aligned with other teeth in the mouth. It could be a defect in the construction also, but that assessment would be needed. Technically it would be possible to repair the crown, subject to the damage to it, but I would suspect a replacement is more likely. The cost will depend on your dental practice and your specific needs. If you attend or are eligible for NHS dental treatment, then the cost will be £256.50 in England, £195 in Wales, £77-143 (approx) in Scotland, £71-£110 (approx) in Northern Ireland. This treatment falls under price band 3, which would also cover any other essential work you may need doing (fillings, root canal treatment etc) at the same time. If you attend a private practice, costs will be around £250-600 as an approximate. I have provisionally booked to go to a clinic in Budapest in Jan ’19. The Dentist proposes to crown around 16-18 teeth over a period of 6 days (mainly for cosmetic reasons). He sounds confident, seems competent & comes well recommended. Is this too many in one go or is this acceptable? This seems quite a large number of crowns to do in short space of time, but technically possible. These crowns are being made by the dentist/lab they have on site? Normally it will take a week or 2 for the crowns to be made, unless they have the latest technology that allows for such a quick turnaround. Presumably the dentist has explained the risks and recovery with doing so many at one time? I have spent a lot of money over the past 15 years on bridges, crowns and implants. The majority of the work was private and my original implant lasted only a few years. My current dentist is very good, however, a recently fitted crown is a very poor match to its neighbouring bridge. She says that this is because the bridge was private and the crown is NHS and accordingly the best match available. Is this correct? This wasn’t explained to me prior to the work. From what you say, in part this sounds like it could be correct. Whilst both NHS and private dental practices will offer products that should look good and stand the test of time, the materials used and the quality will differ. The NHS has to a point work to a budget. You may have a bridge made of more premium and better quality materials that look more natural. However, I am somewhat surprised the colour match is that bad. They should be fairly close and I would have suspected, had the dentist known there would have been significant difference then they should have made you aware. Teeth have various shades and it is my understanding that in the process of getting a crown created the appropriate colour shade for your teeth is selected to ensure the closest possible match. I’ve lost a lost of a tooth in my smile but i had a white filing which lasted around 7 years now its fallen out I’ve been told I’ve only two options an extraction or a crown. Why hasn’t my dentist offered me another filling? To get the most accurate answer to this question, it would be best to ask your dentist directly as they have seen your tooth and have your records and can give a thorough explanation as to why. I suspect, that the filling served you well, but where it has come out and over the time it has been in place the tooth has weakened and essentially a filling would now not be suitable. A filling does fill a hole and gives strength to a tooth, but it relies on the remaining tooth structure to be strong enough. I hope this helps and explains why this might be the case.